This photograph is not a completed flooring project, it shows “work in progress” on a home in Pacific Palisades. 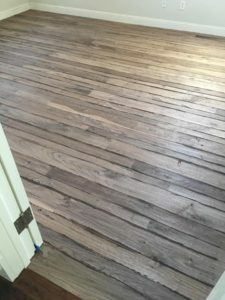 This floor job is a three step process; installing the solid walnut floor, hand distressing the floor (shown in this photograph), and then adding color to the floor. Previously we installed random width solid walnut flooring in four bedrooms in this Pacific Palisades home and now we are matching the floors in the rest of the house with the same random width solid walnut floor. Again this shot shows the hand distressing and when the color is added and the floor job complete Greg will send finished pictures. There are many ways to have the hardwood floor look in your home; engineered, laminate, etc. A pure hardwood floor job is one that starts with the raw wood (maple, oak or whatever your choice),then is hand detailed or not and finished by adding the color. For the best results on you wood floors, whatever your choice of material be sure to use a company that only provides hardwood flooring services for the best results. We at “www.greggarberhardwoodfloors.com” have been in business since 1976 doing only floors..